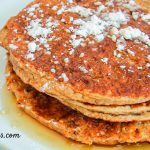 Start your day with a filling protein pancakes recipe that uses real foods only, making it the perfect breakfast or snack for everyone in the family. Lightly coat a large nonstick pan or cast iron skillet with butter and heat over low heat. Pour batter into skillet to form pancakes. Cook until bubbles appear on top. Flip cakes and cook until golden brown on underside. A smoothie cup is just big enough for one batch. Alternatively, use a big blender to make several batches at once. Then freeze in zip-top bags with a layer of wax paper between each pancake.